Temple Lodging in Japan "Fukuchi-in"
I visited this shukubo as a guide for the video shooting of a TV program featuring Mount Koya, so I did not stay overnight. 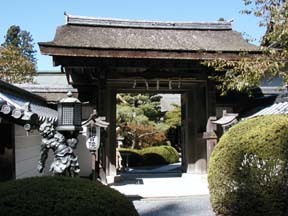 This shukubo is famous for a garden that is adjacent to the building. So, you are able to fully appreciate it even walking through the corridor. 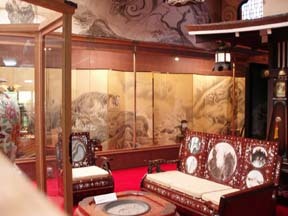 In the central lobby, a statue of Dainichi-Nyorai made in the Kamakura period, a Buddha statue made in the Asuka period and a picture of a tiger and a dragon on a standing screen, as well as various gorgeous furnishings, are displayed. They were very overwhelming. 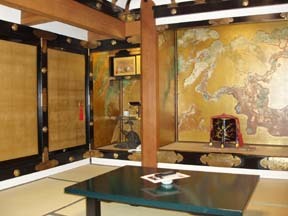 In a special room, Chikurin Yukaku-zu painted by Tanyu Kano is displayed. You are able to see this exquisite cultural asset up close. 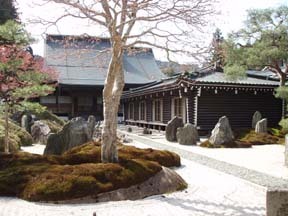 The Aizentei garden spreads outside the window. All this will make you feel like a feudal lord. 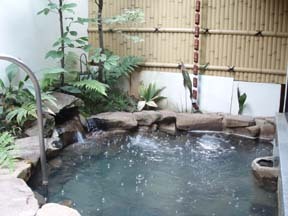 When it comes to bathing, the ladies' bath is a natural outdoor hot spring bath, the only one on Mount Koya, and it is equipped with a low temperature herb sauna facility and an after-bath rest area with a massage chair; it seems that you will be able to relax and remove the fatigue of a trip. 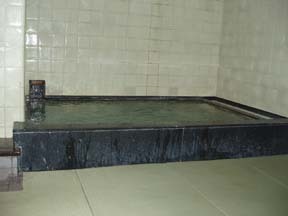 The men's bath is a tatami bath. It is a surprising combination of a bath and tatami mats. It does not hurt even if you fall or you can simply lie down and relax. It gives you comfort different form that of the women's bath. 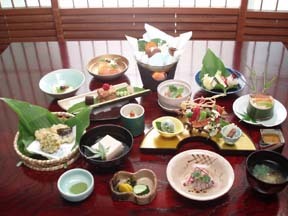 We saw their shojin vegetarian cuisine during the video shooting. It looked colorful and delicious. The dessert, which was a piece of cake, was a bit of a surprise to me. There is a souvenir shop and a coffee shop in the lobby. They sell Fukuchi-in's original goods. They provide a yukata robe, a towel and a toothbrush in the rooms. The rooms are private but the doors cannot be locked. (They can be locked from inside.) There is a safe in the room. They hold religious services in the morning. It seems that many foreign guests stay there.